It’s that time of year again. There’s a chill in the air, and with the leaves falling and Halloween looming just around the corner (no, for real, it’s in less than 3 weeks), we all know what time it is. That’s right, it’s pumpkin spice season. Everything from pumpkin spice vodka to pumpkin spice Pringles (yes, you read that correctly) - there’s a lot of pumpkin spice going on these days. Not that I’m complaining. I love a good dose of pumpkin spice. Why, just last night the husband and I bottled our latest and greatest homebrew, a pumpkin spice ale we’re calling ‘Linus’. It’s a pretty tasty concoction. And so, with this pumpkin spice frenzy going on, it seemed like a good time to whip up some of my own pumpkin spice delicacies, this time in the form of cinnamon rolls. I mean honestly, what screams fall better than a warm pan of gooey cinnamon rolls fresh out of the oven? I’ll tell you what - pumpkin spice cinnamon rolls. While baking these beauties, the house smelled so fantastic, I could hardly wait long enough for them to cool before grabbing one and digging in. And I was not disappointed. 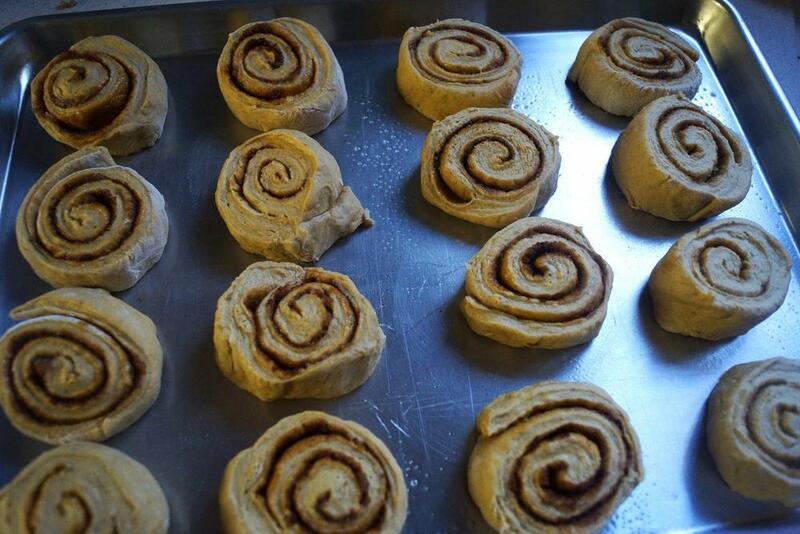 Sure, cinnamon rolls require a good amount of work. They take some time and some elbow grease. You have to be patient. But trust, me, it’s totally worth it. One of the most important things I’ve learned from making cinnamon rolls is that slicing them can be a huge pain. Until I discovered the dental floss trick. You see, after rolling the dough up into one giant cinnamon log, slicing it into individual rolls usually resulted in weirdly shaped, oblong rolls, due to the pressure from the knife squashing them. If, instead of a knife, you wrap a piece of dental floss (unflavored, preferably) around the roll, then cross the ends and pull them in opposite directions, you’ll end up with perfectly cut slices. Not to mention, no knife to clean. You’re welcome. 1. Mix water, honey, and yeast together in a small bowl. Allow to sit for 5-10 minutes, or until the mixture begins to bubble. 2. 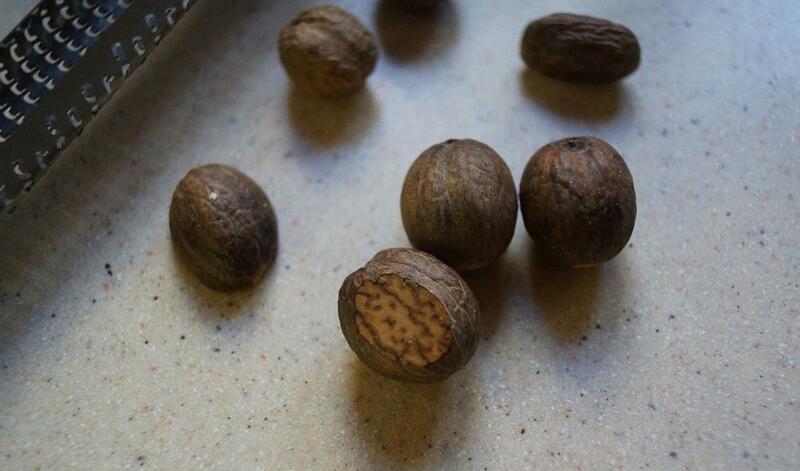 Mix the flour, salt, cinnamon, ginger, allspice, cloves, and nutmeg together in a large bowl. Add the pumpkin and oil, and once fully combined, add the water/yeast mixture. Mix until all ingredients are fully incorporated and a cohesive dough is formed. 3. Knead dough for 6-8 minutes until it passes the windowpane test. Place dough in a bowl coated with cooking spray and cover with plastic wrap. Allow dough to rise for 60-90 minutes. 4. 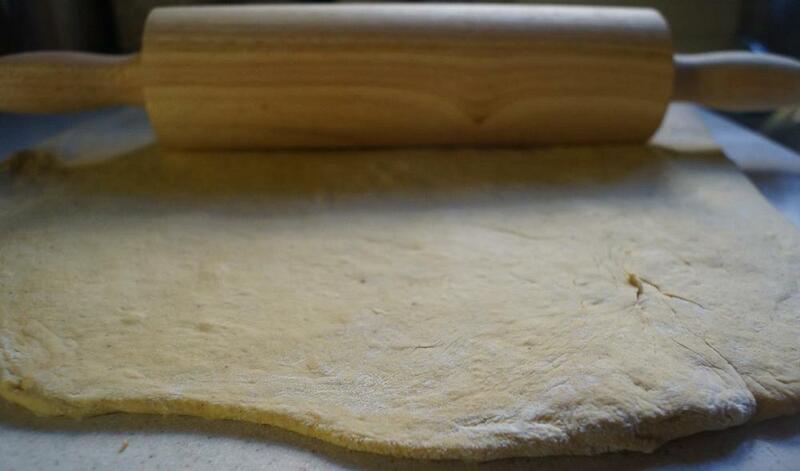 Remove dough from bowl, and roll out on a floured surface to form a 20 x 16 inch rectangle. Cover dough evenly with the melted butter, then sprinkle evenly with brown sugar and cinnamon. 5. Starting at the shorter end, roll the dough up to form a log. Cut roll into 16 1” slices, place slices on a greased baking sheet. Cover baking sheet, and allow rolls to rise for an additional hour. 7. Bake cinnamon rolls at 375 for about 30 minutes, or until rolls are golden. Cool slightly. 8. While rolls cool, whisk together the powdered sugar, vanilla, and 2 Tbsp milk. Icing will be thick - add more milk to for a thinner consistency if desired. 9. Pour glaze over rolls while they are still warm, but not hot. Top with roasted pepitas. Devour immediately.